ASB is taking advantage of the social networking phenomenon by making their branches available to anyone who has a Facebook account. Their new app, launched in July, in the popular website allows their customers to make payments to other banks and their Facebook friends with only a series of clicks. ASB Bank is one of the first banks to launch an app that allows their customers to take advantage of their services on Facebook. While other banks may have adopted online and mobile banking to their service, ASB has pushed it a step further by tapping the popular social networking website, facebook. Since its launch about 10% of its total mobile payments were made through facebook. Payments that have been made using the app has already reached more than NZ$ 1 million. The app has been downloaded at least 160,000. One of the interesting features of the app is a payment option that allows their customers to pay each other without having to meet or go to the actual bank branches since payments can be processed to any legitimate New Zealand bank account. The popularity of smartphones allows users to access their accounts anywhere. ASB made sure that they are able to reach all users by making the app friendly to Apple and Android smartphone users with a Windows version set to be launched. More than NZ$ 1 million worth of payments made so far using the app. ASB’s Facebook app has been downloaded 160,000 times since launch. 10% of mobile payments are made using the app. Watch interest.co.nz’s video interview with ASB Bank’s Anna Curzon. Australian and New Zealand banks have proved very innovative in the last couple of years. And if ASB Bank was not the first bank to enable facebook users to send each other payments, Commonwealth Bank of Australia (CBA) launched the market leading kaching mobile payment app for iphone about 10 months ago, they became the first bank to launch a virtual branch on facebook back in September 2010. In your opinion, will facebook ever become a significant source of mobile payments? Do your banking customers want or even need to send and receive payments via the most popular social network? Are they comfortable enough with the (lack of) level of security from facebook apps? @Anna_Curzon how have U been? Congrats 4 the traction in mobile payments via fb (good video!) http://t.co/cd9VgeIv Fancy some Q&As on VB? 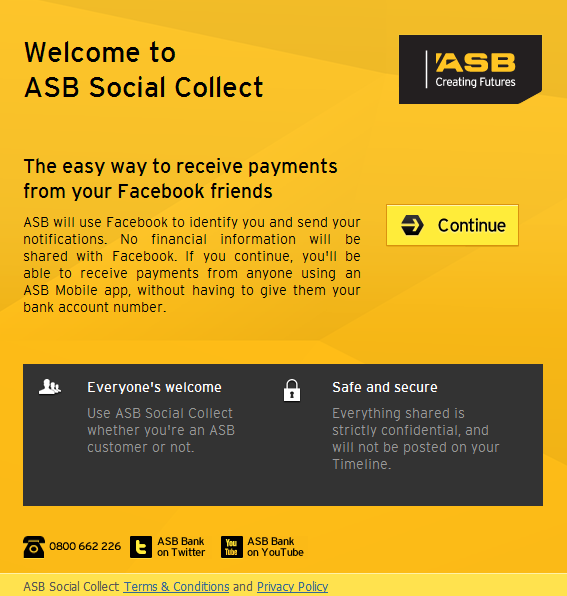 10% of ASB Bank’s Mobile Payments via Facebook http://t.co/cd9VgeIv ¦ @NAB @SuncorpBank @CommBank @UBank Any comments? RT @Visible_Banking: 10% of ASB Bank’s Mobile Payments via Facebook http://t.co/cd9VgeIv ¦ @NAB @SuncorpBank @CommBank @UBank Any comments?